Diagnosis and treatment of anterior uveitis can be a challenging endeavor. I do, however, find helping patients through this painful condition to be satisfying. I hope my discussion provides practical information that will assist the primary care optometrist in the confident management of this disease. By definition, uveitis is inflammation of the iris, ciliary body, and/or choroid. It also frequently affects adjacent structures such as the cornea, sclera, vitreous, or retina. The International Uveitis Study Group established a diagnostic system based on the primary anatomical site that’s involved. Inflammation predominantly of the iris is termed anterior uveitis. Intermediate uveitis chiefly involves the ciliary body while posterior uveitis affects the choroid. These represent two distinct immune responses with different biochemical mediators. Clinically they present with differences in objective findings. Identifying these differentiating signs is important as granulomatous uveitis has a higher association with causative systemic disease. Uveitis has more than 85 known causes, originating from several different pathophysiological processes—surgery, autoimmune disorders, infections, malignancy, or toxins. However, anterior uveitis most commonly does not have an identifiable systemic cause. Roughly 50% of all non-mechanical cases are considered idiopathic. In those with a history of uveitis, I start by assessing whether the case is a recurrence or relapse. Recurrence is a repeat episode after three months of quiescence off all treatment. This is often associated with underlying systemic disease. A relapse is a return of uveitis within three months (attributed to inadequate treatment) and is more commonly noticed in younger patients. Patients with acute uveitis may complain of light sensitivity, pain, tearing or decreased vision. Those with chronic uveitis, however, often have only mild symptoms, such as fluctuating vision and intermittent eye aching. I begin by observing for any obvious external disease, quickly looking over the patient from head to toe, focusing on the ocular adnexa. I look for skin lesions, lacrimal gland swelling and/or pigmentary changes of the skin or lashes. 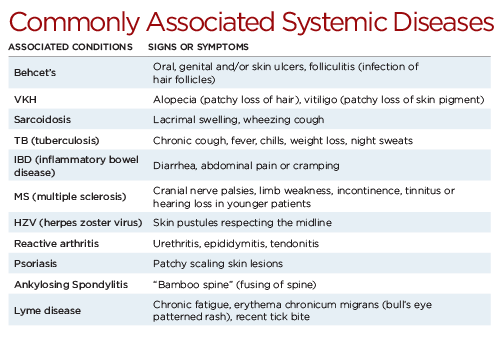 While I look for evidence of systemic disease, I avoid asking too many questions in regards to specific symptoms. Infectious disease specialists or rheumatologists become a valuable resource when diagnosing any complex or multi-systemic conditions. 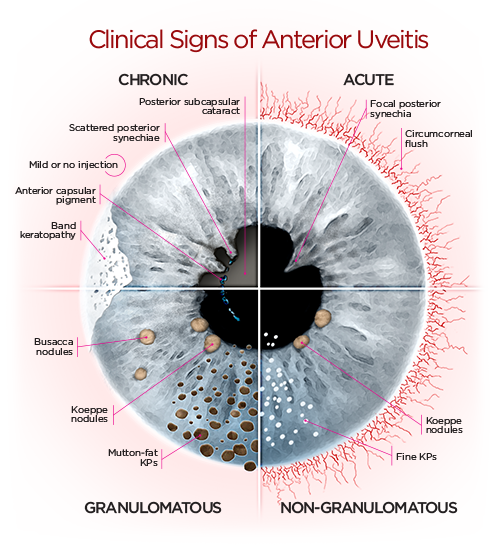 Chronic uveitis usually presents with little to no injection. In acute uveitis, the bulbar conjunctiva is substantially injected with increasing redness toward the limbus. Injection from infectious conjunctivitis, in comparison, is usually worse near the fornix. Keratic precipitates (KPs) are clusters of inflammatory cells which accumulate on the corneal endothelium in a triangle configuration. Any deviation from this Arlt’s triangle pattern should raise suspicion of fuchs’ heterochromic iridocyclitis. Small or fine KPs are white or lightly pigmented and round. They characterize non-granulomatous uveitis. In contrast, mutton-fat KPs are large and greasy and are classically a sign of granulomatous disease. Iris nodules are concentrated clusters of inflammatory cells on the front surface of the iris. Koeppe nodules are on the pupillary margin while Busacca nodules are found elsewhere throughout the iris. It can be important to look for and correctly differentiate the two types of nodules as Busacca nodules are pathognomonic for granulomatous disease. 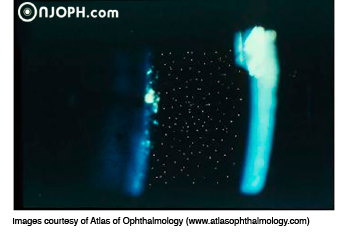 The hallmark sign of anterior uveitis is the presence of cells floating in the anterior chamber. These have been released from either the iris or ciliary body’s vascular circulation. Bright illumination in a dark exam room is best for viewing cells. I use a high magnified 1mm by 1mm beam with a starting angle of 50 degrees. Be patient and actively adjust the settings incrementally if nothing is seen at first. The grading of anterior chamber cell density is the main index of severity and treatment success. The SUN grading scheme is a helpful guideline. A practical benchmark is that cataract patients a day after surgery have around 2+ cells that decrease to trace at one week. This can help develop consistent grading estimations for other causes of uveitis. Flare is the plasma protein released from uveal circulation. Flare looks like a grayish-white haze in the anterior chamber slit beam. Fibrin, one component of flare, is sticky and can lead to synechia. Posterior synechiae are iris attachments to the front of the lens capsule while anterior synechiae are iris-corneal adhesions. Extensive synechia is a sign of chronic inflammation. Circular pigment clumping on the anterior capsule is a sign of previous episodes of synechia and therefore uveitis. While isolated synechia are not significant, extensive synechia can increase IOP. Posterior synechia can cause pupillary block while anterior synechia can directly occlude the angle. 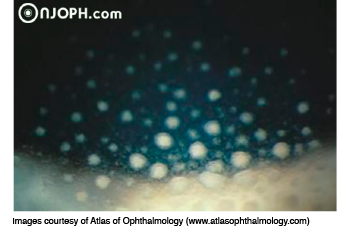 IOP is usually low in most cases of acute uveitis as an inflamed ciliary body has less aqueous production. High IOP may indicate synechia or conditions like Posner-Schlossman syndrome or herpetic uveitis. Uveitis in pseudophakic patients may indicate chronic irritation of the iris or ciliary body from the IOL causing uveitis-glaucoma-hyphema syndrome (UGH). This is most common in patients with astigmatism-correcting or sulcus-fixed IOLs. Persistent or severe uveitis in post-cataract patients can also be caused by residual lens fragments, TASS (toxic anterior segment syndrome), or endophthalmitis. All these conditions warrant immediate referral back to the patient’s cataract surgeon. Cells in the anterior vitreous, and cystic macular edema, are not uncommon in anterior uveitis. Severe anterior uveitis with cystic edema should be aggressively treated and a retinologist consult considered. Fast and sufficient treatment of uveitis is extremely important. Left untreated, uveitis can be sight-threatening causing posterior capsular cataracts, obstinate cystic macular edema, or glaucoma. Most treatment failure is due to inadequate steroid use. Even though there is a well-established correlation between high-dose steroid use and steroid-induced complications, judicious steroid use is a must. Cataracts can be fixed and IOP controlled, but permanent tissue damage due to inflammation cannot. Pred Forte (topical prednisolone acetate 1%) is my first choice topical steroid. I dose it generously and aggressively. I start by pulse dosing every 1-2 hours for the first few days reducing to QID once clinical improvement is noted. I begin my taper ONLY after a two-grade improvement in clinical signs. This entails dropping one drop daily every 5 days until cessation (ex. TID to BID for 5 days then BID to QD for 5 days then discontinuing). If there is relapse, I start treatment over with a pulse dose and plan for a longer taper schedule. I generally save Durezol (difluprednate 0.05%) for patients who have initially failed on Pred Forte. This relatively new medication is particularly helpful in treating severe anterior inflammation associated with cystic macular edema. As well as being potent, it does not need to be shaken before use, making it a good choice for questionably compliant patients. QID dosing has been shown to be as effective as Pred Forte dosed eight times daily. If there is no improvement within two or three weeks, refer the patient for more specialized care. A topical cycloplegic drop has several benefits. It helps control pain from ciliary spasm, provides a weak anti-inflammatory effect, and prevents or breaks synechia formation. In milder cases with open angles, I find one drop of atropine 1% given in the exam room to be sufficient. I do not generally consider a systemic work-up in most first episodes. This is especially true if the inflammation is mild, unilateral, or non-granulomatous. I consider laboratory testing only if the inflammation is bilateral, granulomatous, or chronic in appearance. Selecting laboratory tests based on the patient’s unique signs and symptoms usually yield more useful information. In the absence of any clues to a specific cause, I usually start by ordering RPR or VDRL, FTA-ABS, PPD, chest radiograph, ACE, Lyme titer, ESR, RF, and/or HLA-B27. However, I caution against using a non-specific work-up for every patient. The results can be confusing to both you and your patient. While most cases of anterior uveitis are idiopathic, the HLA-B27 genetic marker is common in the Pacific Northwest’s Caucasian population with acute uveitis. If you practice in this part of the country, it is not unreasonable to test for HLA-B27 exclusively in your first round of blood testing. By using a systematic approach, anterior uveitis can be confidently managed by the primary care optometrist. Most cases can be treated simply with prudent use of topical steroids and cycloplegics. With poised management of this often isolated condition, you can quickly become the hero to a suffering patient and play a vital role in improving their overall health and well-being. If you have questions or wish to discuss a specific case, please feel free to call any of our optometric physicians.